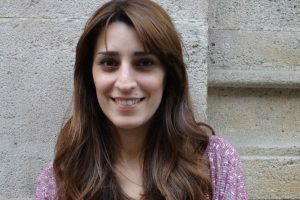 hen I met Ariadna Serrahima (Barcelona, 1984), my attention was immediately caught by her ability to analyze and question whatever surrounded her. We are living in an era of change and, in this context, Ariadna’s discourse sounds both logical and innovative. 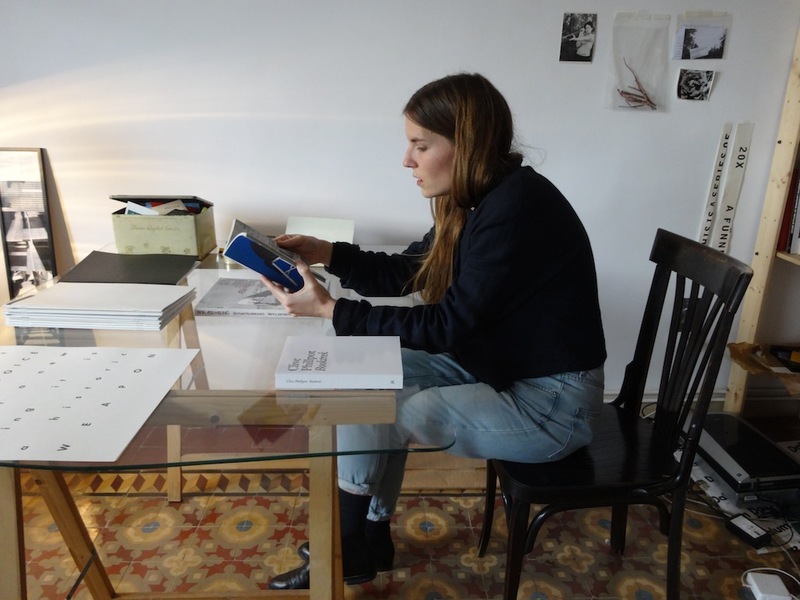 We first meet at her apartment in Gràcia where she shows me her collection of art books and the graphic and visual material that she generates concurrently to her work as a graphic designer. 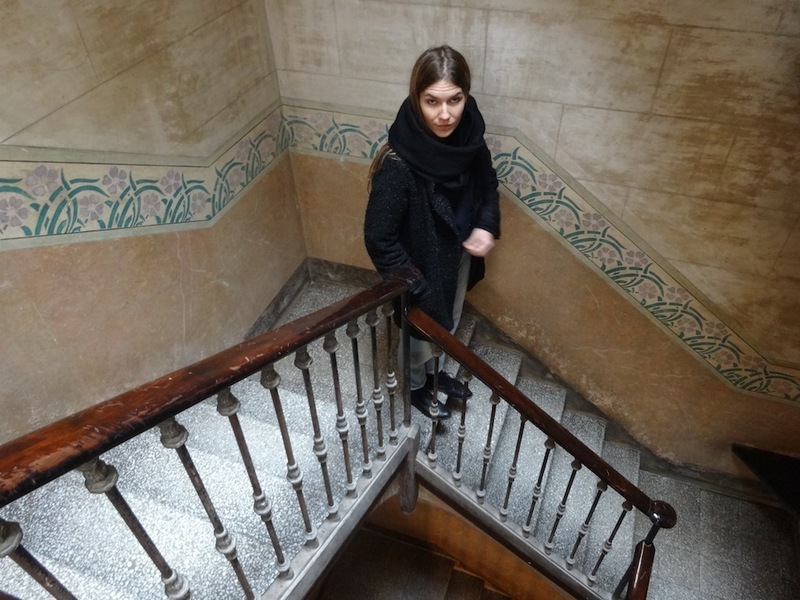 I ask her about her trajectory and, specially, about what it has signified to get associated, in the context of today’s Barcelona, in order to recuperate L’Automàtica, a printing house that three years ago was about to shut and where she takes me after showing me her place. She starts explaining: ‘to go back to producing, without any kind of romanticism, through a medium that was practically lost, facing new paths and new problems.’ Whoever is involved in the profession of the Graphic Arts, is not a craftsman, but is neither an artist. 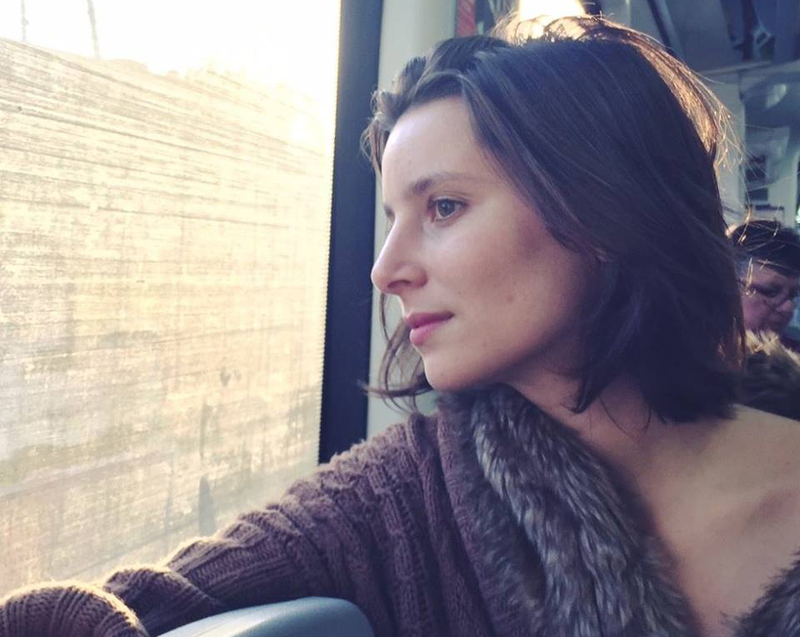 Ariadna’s words are very linked to the panorama that a large part of our generation is living: we need new terms to define ourselves despite the fact that, often, we no longer accept (or no longer need) this self definition. You spend most of your time in Gràcia. Yes, I live in this neighborhood because the Studio where I work is just on the corner and L’Automàtica is three blocks away from my house. This allows me to safe time commuting from one place to another. In London, this was impossible for me. You lived there for five years. Five and a half years. I did all my studies there: first Art at the Camberwel College of Arts and, for a number of reasons, I changed and continued studying graphic design at the Central Saint Martins College of Art. After that, I went to New York for six months until I decided that it was time to return home. How did you perceive Barcelona after all this time away from it? At the beginning it took me a while to adapt. I was very used to Anglo-Saxon individualism and was always doing my own thing. Social relationships here in Barcelona are way more forthcoming. Also, it took me some time to understand that the design that is made here often lacks content, it is heavily based on formal work. After I realized all this, a moment arrived when I decided that, either I started to look for things that really interested me in this city and also started know other people, or that I left again. After a while, I arrived to the following conclusion: why do we always hope that others will make interesting contributions and not ourselves? During the past four years, I have been collaborating and working with other people and we have started a series of projects that have been important and interesting from our professional activity and based on our concerns. Yes, I am a hybrid between different disciplines. When you don’t have a very specific profile, it is complicated than others will come to you, it becomes necessary to start your own projects and to allow your own work to explain what you do. I would like to know about process by which you have had to go through (or you’re going through) in order to be able to carry out your own projects in Barcelona. It is true, and knowing that, what could you do? My first experience in a collective was in London. For 4 years we occupied a home with other people: they were all students of photography, ‘sound art’, film … etc. It was a very conscious decision that allowed us to ask ourselves a lot of questions, to position ourselves in the big city, to be critical, analyzing the cost of living and the various communities that surrounded us. Intuitively, we had the need to get together and share all that we were going through. In Barcelona, I have found myself living again within a collective, but from my profession’s perspective. In this city, despite the fact that it’s a disaster in many ways, there is a lot to be done and so much to change, this is positive in many ways. 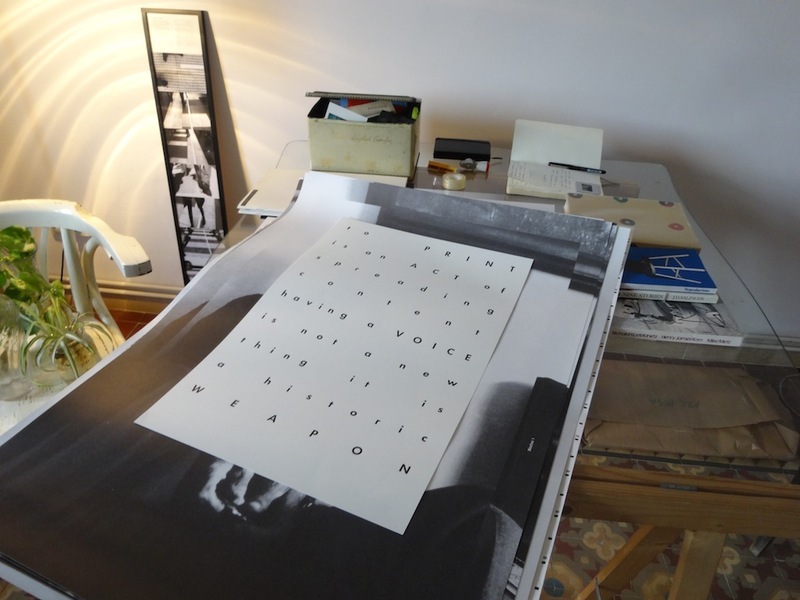 And, it is exactly what you’ve ended up doing with your Studio or with L’Automàtica, for example. Please, tell me about these projects. For those who don’t know about L’Automàtica, could you explain what it is and where it comes from? I will start from the beginning. In 2011, when the movement 15-M took place, all those who were working in the Studio got interested in it, and individually, every day after work, we went down to Plaça Catalunya and listened to people talking. We knew that something important was happening and we began to do interviews, and record what was being said in the assemblies. We observed that, as designers, we almost never said anything because we are not very good speakers. However, we are good communicators, so we decided to design and publish a newspaper called Dinou (nineteen in Catalan), in it we had put together all the main ideas that we had recorded during those meetings. We printed 5000 copies that were distributed on the 19th of June 2011 during one of the largest demonstrations that took place at that time. Those were intense months, but what remains of that in 2014? Well, it remains for example, L’Automàtica. 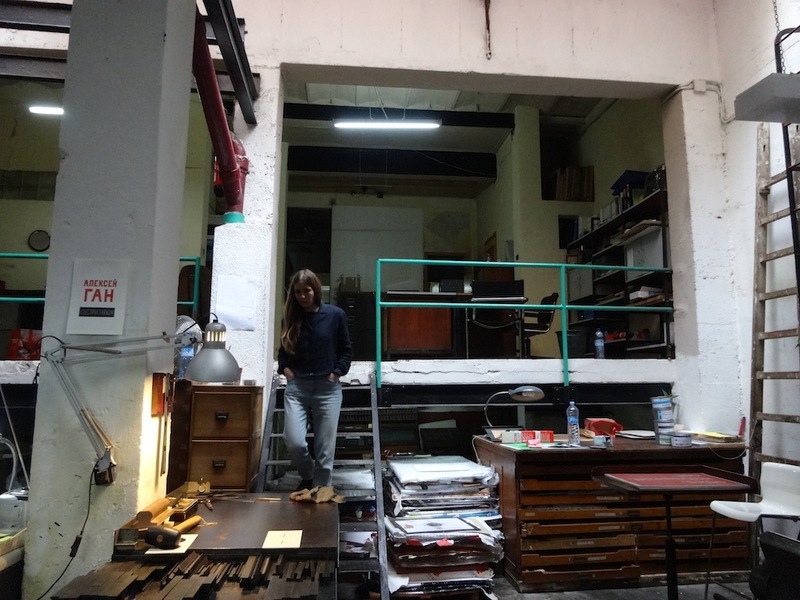 Here is where I wanted to get: a couple of months after the 15-M, a friend came to the Studio and told us that there was a printing house in our neighborhood that was about to be closed. If this had happened 8 years ago, it would simply have been another printing house that shuts, but at that time we decided we had to do something. One of the most interesting conclusions that we had was precisely the importance of recuperating that space instead of buying it or buying the material it would no longer be needing. The difference between a concept and the other is abysmal. When I previously said that there is a lot to be done in Barcelona, I have to nuance that idea: plenty of projects are already being developed! There are people who say that the 15-M was a bubble and that was it; it’s not true because many projects such as L’Automàtica arose from the reflections of those days. This was almost three years ago. I would like to know about the daily life and the work that is generated now, after the printing house’s recuperation? One of the most important things that L’Automàtica experience is teaching us is that a discourse is created by working. So, our discourse is all about: ‘do, make things happen, be active’. On the other hand, recuperating this printing house has allowed us to learn and love a craft, to design through graphic production, experiment, organize workshops, generate complicities with people from the city who comes to produce with us… We need to know how to work with different tools and know which ones are better depending on whatever you need or want to achieve in each project. Everything has its time, its gesture, its process, its willingness and his technique. 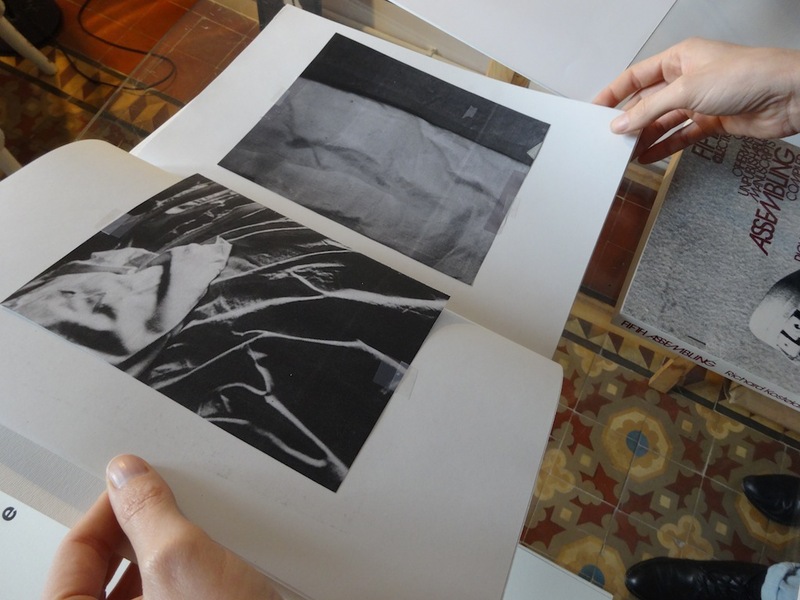 We have been able to experience this by printing with the old mobile types in L’Automàtica’s machines. From here, other projects have started to get materialized, tell me about them. It is easy to look at L’Automàtica as a romantic and nostalgic project, but we are not interested in this vision. What interests us is that we have recuperated a space of work and production that works on the basis of self-management. 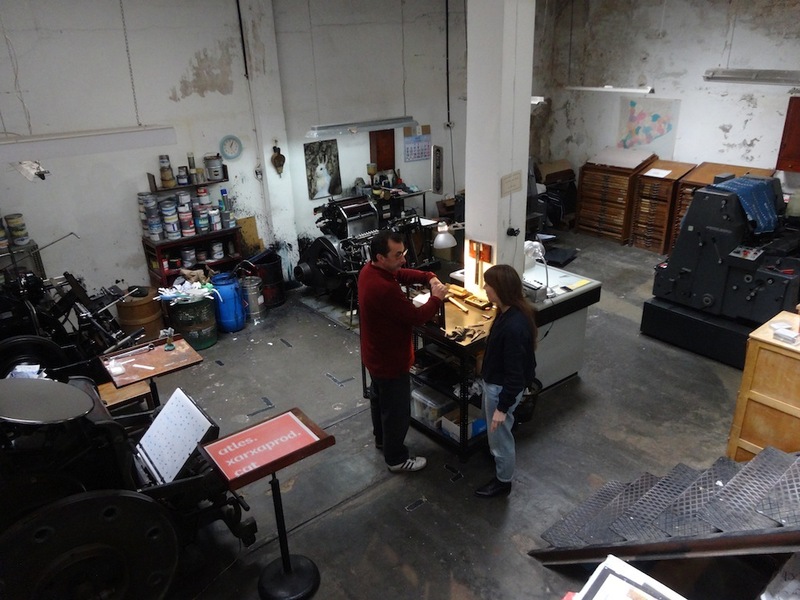 Having said that, L’Automàtica is much more than just a printing house. To what conclusions you have arrived after these reflections? Quan vaig conèixer l’Ariadna Serrahima (Barcelona, 1984), de seguida em va cridar l’atenció la seva capacitat d’analitzar i qüestionar l’entorn. En una època de canvis com la que estem vivint ara, les paraules de l’Ariadna em semblen lògiques i trencadores a parts iguals. Em cita al seu apartament de Gràcia, on m’ensenya diapositives i les darreres adquisicions per a la seva col·lecció de llibres. M’interessa conèixer la seva trajectòria i especialment el que ha significat associar-se, en el context de la Barcelona d’avui, per recuperar una impremta com L’Automàtica: deixar l’ordinador i tornar a produir, sense cap mena de romanticisme, a través d’un mitjà que pràcticament s’havia perdut, enfrontant-se a nous camins i a nous problemes. Qui es dedica a l’ofici de les arts gràfiques no és un artesà, però tampoc és un artista. El discurs de l’Ariadna es vincula molt amb el panorama que està vivint gran part de la gent de la nostra generació, que necessita nous termes per definir-se malgrat que, sovint, ja no volem o ja no necessitem aquesta autodefinició. Passes la major part del temps a Gràcia. Sí, visc a Gràcia perquè tinc l’estudi a un carrer de casa meva i L’Automàtica és a tres carrers. Això em permet no perdre temps traslladant-me d’un lloc a l’altre, cosa que a Londres em passava moltíssim. Vas estar cinc anys vivint allà. Cinc anys i mig, vaig estudiar tota la carrera allà: primer belles arts i, per una sèrie de raons diverses, em vaig passar a les arts gràfiques. Després vaig marxar a Nova York per sis mesos fins que vaig decidir que ja era el moment de tornar a casa. Com vas percebre Barcelona després de tot aquest temps fora? 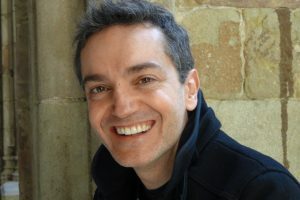 Al principi em va costar adaptar-me perquè no entenia res, m’havia acostumat molt a l’individualisme anglosaxó, sempre anava a la meva. Les relacions socials aquí són més properes. Allà quedes en un lloc concret per fer alguna cosa concreta, i aquí la gent té tendència a establir relacions socials perquè sí. També em va costar molt veure que en el disseny que es fa aquí sovint hi falta molt de contingut. Vist això, va arribar un moment en què vaig pensar que, o em parava de queixar, o tornava a marxar. Vaig analitzar el que veia que estava passant i vaig arribar a la conclusió següent: per què estem sempre esperant que siguin els altres els qui facin aportacions interessants? Si hi ha alguna cosa que em sembla que val la pena, potser ja la puc fer jo. I fa quatre anys que estic en això, però amb altra gent; no sóc l’única que va en aquesta línia. En gran part hem sigut una generació molt acostumada que ens treguin les castanyes del foc: beques, ajudes, etc. Quan, en realitat, no sé fins a quin punt calen aquestes ajudes per poder fer coses interessants si això és el que realment vols. Sí, jo sóc un híbrid de diverses disciplines dins l’art, les arts gràfiques, el disseny… Quan no tens un perfil tan definit és més complicat que els altres et vinguin a buscar, necessites tirar endavant els teus propis projectes i que sigui la teva feina la que expliqui el que fas. M’agradaria saber com és el procés pel qual has hagut de passar (o estàs passant) per poder dur a terme els teus propis projectes a Barcelona. Bé, justament un dels motius pels quals vaig marxar de Londres és perquè al final no em sentia relacionada amb res. És tan gran, la ciutat, la política és tan inaccessible, tot és tan monstruós, que no pots acabar construint res. A més a més, la ciutat és tan fluctuant que cada dos anys et canvia el panorama, els amics, tot. És cert. I davant d’això què podies fer? A Londres vaig ocupar una casa amb altra gent, ho vaig fer d’una manera molt conscient i allà va ser quan per primera vegada vaig començar a elaborar un discurs. Vaig preguntar-me: Per què estem creant un col·lectiu en què vivim d’una manera determinada, compartint-ho tot? No érem hippies, estàvem tots estudiant art, fotografia, cinema; tots teníem els nostres portàtils a la casa. Però, d’una manera intuïtiva, teníem la necessitat d’agrupar-nos i rebel·lar-nos contra aquell món enorme i monstruós que ens envoltava. 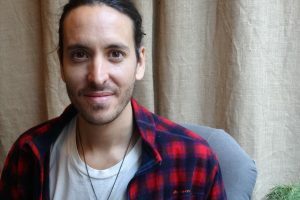 Quan vaig tornar a Barcelona ho vaig fer amb la idea que m’interessava molt construir, crear col·lectius sòlids, més enllà dels quatre amics que ocupàvem una casa a Londres. L’avantatge que té aquesta ciutat, malgrat que és un desastre, és que està tot per fer, en el sentit que aquí hi ha molt per canviar i això et permet construir. I és justament el que has acabat fent amb el teu estudi o amb L’Automàtica, per exemple. Parla’m d’aquests projectes. La meitat dels que estem a L’Automàtica també som gent de l’estudi. Col·laborem entre tots, tenim projectes comuns, generem tertúlies i diàlegs, ens fem créixer els uns als altres. Les nostres iniciatives tenen molt a veure amb buscar i detectar gent interessant. Per a aquells que no coneguin L’Automàtica, ens pots explicar què és i d’on va sorgir? T’ho explicaré des del principi de tot. El 2011, quan hi va haver el moviment del 15-M, tots els que estàvem treballant a l’estudi ens vam interessar pel que passava i de manera individual baixàvem cada dia a la plaça de Catalunya, després de treballar. Sentíem que estava passant una cosa potent i vam començar a fer entrevistes, enregistrar la veu de diferents persones. Cada dia a les set de la tarda hi havia la Comissió de Cultura. Vam observar que, com a dissenyadors, no parlàvem mai perquè no som gaire bons oradors, però en canvi sí que podíem comunicar a través de la nostra professió. Una noia de l’estudi va proposar editar una publicació amb les frases de la gent, que poguessin resumir el que estava passant. Vam crear Dinou, un diari en què a cada pàgina hi havia un missatge concís que podia ser aixecat com a pancarta en una manifestació. El nom «Dinou» ve perquè la proposta era repartir cinc mil exemplars el 19 de juny, que és quan va ser la manifestació més gran que es va fer a Barcelona. La iniciativa va funcionar molt bé. Van ser uns mesos de gran intensitat, però que queda de tot això ara, el 2014? Doncs queda, per exemple, L’Automàtica. Aquí és on volia anar a parar, perquè un parell de mesos després del 15-M va venir un amic a l’estudi i ens va dir que hi havia una impremta que tancava. Era un moment tan sensible que no vam poder deixar passar l’oportunitat. Si hagués passat fa deu anys, simplement hauria estat una impremta més que tancava, però en aquell context ens vam posar a moure fils tots plegats. Llavors va ser quan es va donar el clic: de pensar en comprar, vam decidir recuperar. La diferència entre un concepte i l’altre és abismal. Vam fer que una persona que s’anava a quedar al carrer, (en aquest cas el Ferran, l’impressor), seguís amb feina. També volíem activar el barri, l’economia local. Quan dic que està tot per fer, també haig de matisar: ja s’està fent molt! Hi ha gent que diu que el 15-M va ser una bombolla i ja està; això no és cert, perquè molts projectes com ara L’Automàtica van sorgir a partir de les reflexions d’aquell moment. I d’això ja fa gairebé tres anys. Com és el dia a dia i el treball que es genera, una vegada recuperada la impremta? Una de les coses més importants que ens ha ensenyat L’Automàtica és que el discurs es fa treballant. El discurs és fer, fer que les coses passin, estar actiu. D’altra banda, el que ens permet haver recuperat la impremta és aprendre un ofici, tornar a un ritme de producció més lent i pausat. Treballant, hi ha problemes que puc solucionar amb l’ordinador en cinc minuts, i sense aquest potser m’hi hauria d’estar tres hores reflexionant, però aquesta reflexió també és necessària. Hem de saber treballar amb diferents eines i saber quines toquen en cada moment, depenent del resultat que estiguem buscant. Cada cosa té el seu temps, el seu gest, el seu procés, la seva predisposició i la seva tècnica. Imprimint amb els tipus mòbils a les màquines de L’Automàtica hem pogut experimentar això d’una manera molt clara. A partir d’aquí s’han anat materialitzant també altres projectes. Quins són? A partir de L’Automàtica, que és d’alguna manera el projecte matriu, han sorgit altres coses. Per exemple, un projecte que es diu Munt, que treballo amb el Diego i el Marc, que també formen part de L’Automàtica. 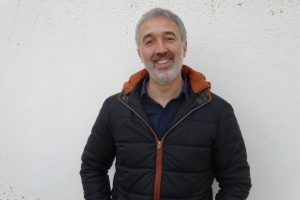 És fàcil posar una mirada romàntica i nostàlgica sobre el fet que un grup de gent hagi recuperat una impremta, però a nosaltres no ens interessa aquesta visió. El que ens interessa és que hem recuperat un espai de treball, de producció i d’autogestió. Dit això, L’Automàtica no tan sols és una impremta, també és això: un espai. Volíem tenir les portes obertes a creadors que poguessin produir allà. Després, també hem volgut que s’obri aquest nou espai a Barcelona, crear-hi un entorn en el qual s’activin diferents moviments culturals. Sempre ens queixem que els museus estan tancant, que els músics no poden tocar enlloc, etc. Doncs ja n’hi ha prou de queixar-nos i utilitzem l’espai que és L’Automàtica per a iniciatives com ara concerts, recitals de poesia o el que sorgeixi. Ens interessa molt la presència, ajuntar la gent i la música, però aquesta no entesa com a concert, sinó com a veu. El projecte Munt reflexiona sobre què significa tenir un espai com aquest a Barcelona en un moment com ara, i com fer-ne ús de la millor manera. A quines conclusions heu arribat a través d’aquesta reflexió?